Meryl Streep: The Fresh Air Interview Meryl Streep won a Golden Globe for her performance as Margaret Thatcher in The Iron Lady. She talks about preparing for that role, her other films and how her perceptions of herself have changed over the years. As of 2012, Meryl Streep holds the record for the actor with the most Academy Award nominations â her tally stands at 17. Meryl Streep is known for completely enveloping herself in her characters, capturing their nuances, speech patterns and personalities. In her films, she's transformed herself into such disparate people as the chef Julia Child, the writer Susan Orlean and plutonium-plant worker Karen Silkwood, winning countless honors and awards along the way. In her latest film, the biopic The Iron Lady, Streep once again fully inhabits a real-world figure — this time former British Prime Minister Margaret Thatcher. Her performance has already won her a Golden Globe and an Oscar nomination, and has earned rave reviews from critics, including Charles McGrath in The New York Times, who wrote that Streep "seems even more Thatcher-like than Mrs. Thatcher." 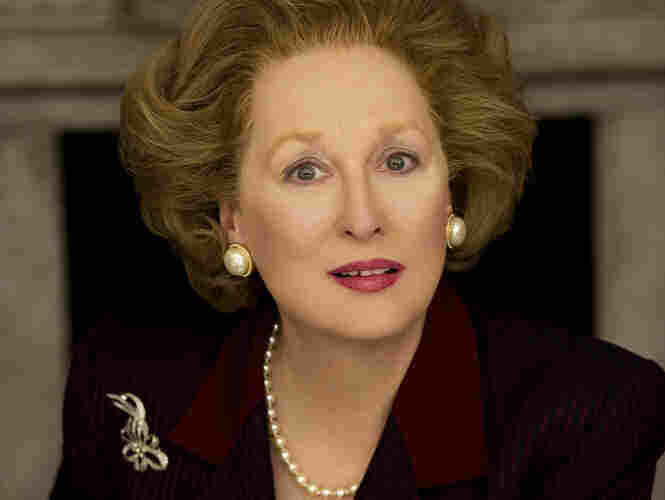 As with all of her roles, Streep conducted extensive research about Thatcher's life before filming began. She learned that Thatcher carried around notecards with quotations from Lincoln and Shakespeare, and that she took voice lessons to sound more confident in her speech patterns. "I remember reading that Lawrence Olivier had something to do with arranging for her to have [voice lessons]," she tells Fresh Air's Terry Gross. "He said he wouldn't care to do it himself, but he steered her in the direction of a good vocal coach. And she did go, and it did help her and and was part of the Pygmalion process." 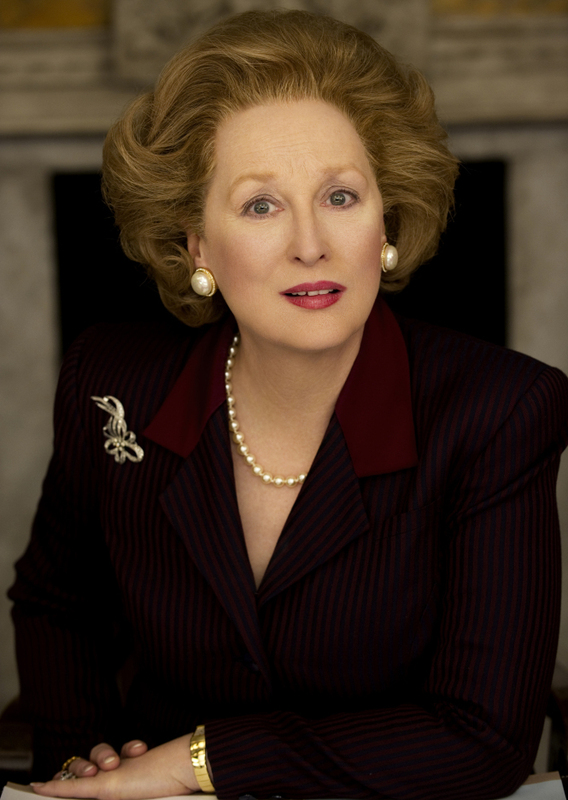 Meryl Streep stars as former British Prime Minister Margaret Thatcher in Phyllida Lloyd's The Iron Lady. Steep explains that Thatcher's vocal coach didn't reinvent her speech; he simply brought out a quality that the Tory leader already possessed. "She already had whatever the stentorian tones [were] that she acquired over time — they were all lying in wait there, within her arsenal," the actress says. "She had ... a plummy kind of aspirant, upper-middle-class voice, and so what the voice coach did was enable her to expand her breath, deepen her voice, bring it to a place where men could listen to it in its most emphatic tones." Streep listened to tapes of Thatcher both before and after the voice lessons in order to capture the nuances of her speech. She focused, she says, on the way Thatcher paused and emphasized certain words to make her points. "[It] had to do with bringing out a word that you didn't normally think was the most important word in the sentence," she says. "And she also had a way, like a railroad train, of taking a breath quite quietly and making a point in a way that you don't realize that this point is going to be made through several examples, and there will not be a break in the speaking voice at any point, and if you think you're going to interrupt her, you're not going to have the opportunity, because she's just got capacity. ..."
It was a stunning quality, says Streep, and one that required a lot of vocal stamina. "I needed much more breath than I have, after all of my expensive drama school training," she says. "I couldn't keep up with her. ... [She gave one speech when she was 65] that I couldn't have done when I was 30 years old, fresh out of drama school. Just the breath. As an actor, you're looking at it and going, 'Just the breath.' It's fantastic." To play Thatcher over the course of four decades, Streep also had to wear prosthetics to age her face and neck. She worked with prosthetics designer Mark Coulier and master hair and makeup artist Roy Helland, who bleached her hair in Sophie's Choice, gave her a brown mullet for Silkwood and shaped her asymmetrical bob in The Devil Wears Prada. Coulier is "interested, in the way I am, in changing the outside to get at something inside," Streep says. "I flew to London [for] three different tests, and it was all about taking away, taking away, taking away. Mark would carve a sculpture of me and then he'd add on, with clay, age. And then they'd cast it in a silicon thing, and I would wear it — and I would say, inevitably, 'Less, less.' So it's kind of remarkable how little I'm wearing." She says she wanted minimal makeup in part so that her face could remain expressive — and in part so the other actors on set would see her as Thatcher. "It's not about the audience," she says. "It's all about fooling the other actors into believing who you say you are. That's hard, when you walk on set, when it's a big makeup job. And I take my entire performance from them, so if they don't look at me and hate me appropriately or love me the way they're supposed to ... then I'm lost, I don't have anything to go on." In a 2010 commencement speech at Barnard College, Streep talked about what she has come to think of as her first role: being a popular girl at her high school. She detailed how she immersed herself in Vogue and Seventeen magazines, trying to imitate the hair and clothes of the popular girls at school. She also adjusted her temperament. "Opinions took a back seat," she says. "Opinions were not attractive. This is stuff I remember thinking when I was quite young. At my house ... you learned to rise above the contending voices, but I recognized early on that that wasn't attractive on a date." Streep calls her high-school performance "a form of acting for a purpose." "Now, I don't think, [girls] don't do that as much," she says. "I have three daughters, and they're all getting along in life on their own terms. And I don't feel they make those accommodations quite in the way we did. But this was something people did." Streep says it's only in retrospect that she thinks about her high-school years as "playing a role." "I wasn't aware of designing myself in high school, but when I got to [college at] Vassar, all of that fell away, because it was just girls and it was the early '70s and it was the classic consciousness-raising time when people were earnestly talking about 'What's a woman? What's our role in the world? What is our capacity? What is holding us back?' "
"I felt free," she says. "A thing emerged, which was my actual personality and my actual voice, I guess, and I realized that I was funny, and allowed to be — and allowed to be loud, and obnoxious — and I took full advantage of it. ... It was an emergence." "That's my way in, the very beginning, how to enter it. Very quickly in the process, I don't think of voice as being separate from the way you hold your head or the way you sit or the way you put on lipstick. It's all a piece of a person, and it's all driven by conviction. All the physical manifestations — you need your way in. When I was a kid — 16, 17 — I'd come home from high school, and my dad collected all of Barbra Streisand's records. She probably had three records out and she was 21. And I knew every single song, every breath, every elision, every swell. And I sang along to it. But for me, it was a way for me to get out the feeling in the song, and the feelings in high school that ... I had no other way of expressing." "I was 13. I didn't like opera. Ew. I liked cheerleading and boys — that was what I was interested in, and Barbra Streisand, The Beatles and Bob Dylan. But I loved singing. I loved it. And I did have a very good coloratura. I listened to my high school Music Man just as I was getting ready to get the Kennedy Center Honors with Barbara Cook, because I had been to see her when I was a kid in The Music Man on Broadway. And I had sung the part in my high school production and it's very good, but it's a voice I don't have anymore. It was very high and light and free." 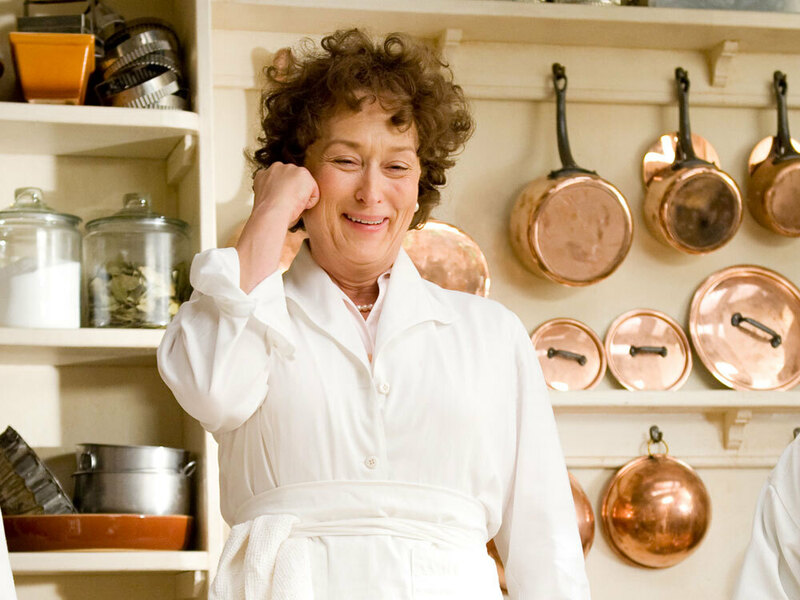 Meryl Streep played Julia Child in the 2009 Nora Ephron film Julie and Julia. "Julia Child's so alive. Margaret is so designed, so intent upon making her point. That's the most important thing — that she win the argument — and there is nothing that stands in the way of that train. Julia's just alive in front of you; that's part of why people loved her." "It's a part of my body. It was very hard. But yes, it did align things for me in my head and in my heart about what's important and what doesn't matter a damn." "I remember when I turned 40, I was offered, within one year, three different witch roles. To play three different witches in three different contexts. It was almost like the world was saying or the studios were saying, 'We don't know what to do with you.' ... I think there was, for a long time in the movie business, a period of — when a woman was attractive and marriageable or f- - -able, that was it. And then they didn't know what to do with you until you were the lioness in winter, until you were 70, and then it was OK to do Driving Miss Daisy ... [and] things like that. But that middle period — the most vibrant of a woman's life, arguably, from 40 to 60, no one knew what to do with them. That really has changed, not completely, not for everybody, but for me it has changed. Part of it has to do with, I wasn't that word that I just said that you bleeped before; when I was a younger actress, that wasn't the first thing about me." When I made 'The Devil Wears Prada,' it was the first time in my life that a man came up and said, 'I know how you felt. I have a job like that.' First time. "Or Sophie. And they were a particular kind of feminine, recessive personalities. No question that this person was not going to dominate the conversation at a dinner party. So they fell in love with her, but they didn't feel the story through her body. It took [me until] The Devil Wears Prada to play someone tough, who had to make hard decisions, who was running an organization, [where] a certain type of man [was able] to empathize and feel the story through her. That's the first time anyone has ever said that they felt that way."